Although I have mainly arranged objects created by others, I have been thinking about relationships and what's really important in life. It's great to create this kind of work in addition to the museum critique projects. This work of my own creation is what I am excited about now. Image size: 20 x 24"; paper size: 30½ x 34". Edition 15. Spit bite aquatint with gampi paper chine collé. Spit bite aquatint with color aquatint. Image size: 20 x 24"; paper size: 30½ x 34". Edition 20. Spit bite aquatint with direct gravure. Wilson was born in 1954 in Bronx, New York, and continues to live in New York. His family background is African-American, Euro-American, Cherokee, and Caribbean. Shortly after graduating with a B.F.A. from the State University of New York at Purchase in 1976, he worked in the education departments of the Metropolitan Museum of Art and the American Museum of Natural History. He has also worked as an installer of artworks at the Museum of Modern Art in New York. Wilson is best known for rearranging museum collections, using the same design techniques museums use but coming up with a different point of view. In a work called Cabinet Making in the Maryland Historical Society, Baltimore, in 1992, for example, he placed four elegant parlor chairs facing a whipping post from a Maryland jail. Even his gallery exhibitions often mimic museum interiors. For an exhibition at his New York gallery Metro Pictures in 1991, he displayed four skeletons laid out in glass cases, labeled Someone’s Sister, Someone’s Mother, and so on. Wilson’s work sets up ways for people to step for a moment beyond their habits in connecting seeing to understanding. Wilson has said that his recent work concerns “relationships and what’s really important in life.” The etchings published by Crown Point Press in 2004 fall into this category. To make them, the artist dripped acid onto copper plates to create what are, literally, ink spots in the finished prints. The ink spots pulse, expand, and seem to explode. “All kinds of things are going on in this microcosm or macrocosm,” Wilson says. In three of the six prints, conversations are going on. Tiny word balloons float among the spots. The words were all spoken by black characters in literature, characters created by white writers from Shakespeare to Herman Melville, to Arthur Miller, to Jean Genet. His exhibition history began in 1981 with his inclusion in a group show at A.I.R. Gallery. He showed at the Sculpture Center in 1982 and in 1985 participated in Art on the Beach, sponsored by Creative Time. In 1988 he created a temporary outdoor sculpture for the Public Art Fund. All of these venues were in New York, as was Wilson’s first one-person exhibition, The Other Museum, in 1990 at the alternative art space White Columns (traveling to the Washington Project for the Arts in Washington, DC). In 1990 he received a grant from the National Endowment for the Arts. In 1991 Wilson had one-person exhibitions at two New York galleries: Gracie Mansion and Metro Pictures. He continued to show at Metro Pictures in subsequent years. 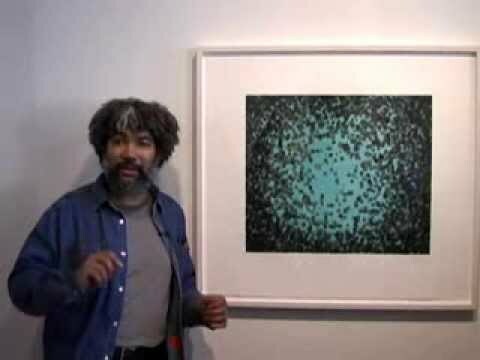 Artist Fred Wilson describes printmaking at Crown Point Press in San Francisco, 2004.